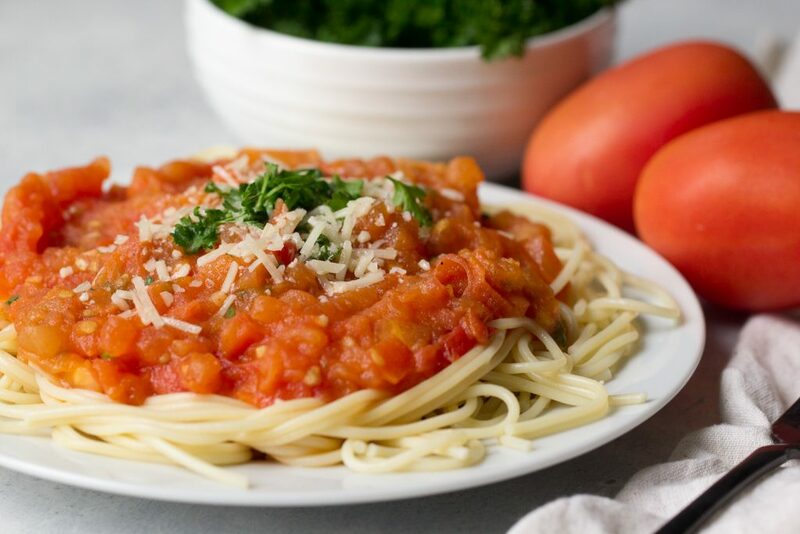 Don't be intimidated by making homemade pasta sauce! 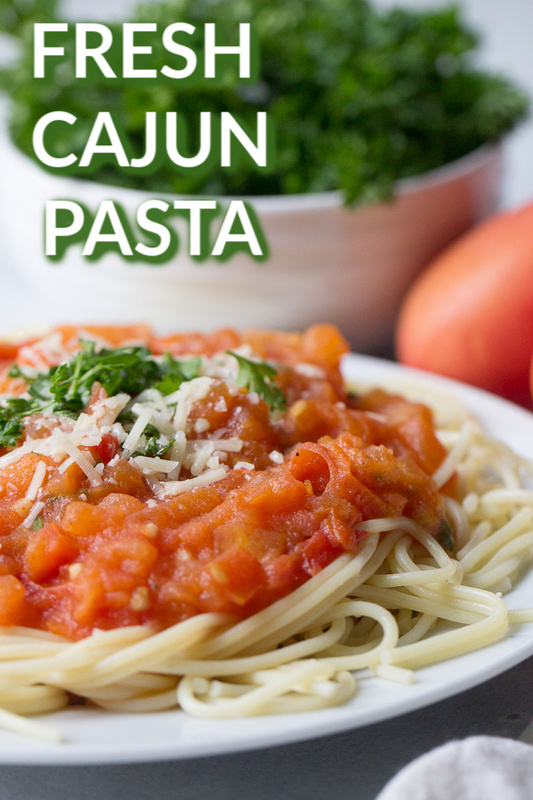 Our Fresh Cajun Pasta is easy, delicious, and just a few simple ingredients. Grab some roma tomatoes, a few spices, and your favorite pasta dinner is ready in no time. The weather is forecast to be in the 70’s ALL WEEK. I just about shouted for joy! I love finally being able to walk outside with a jacket, and feel the sun on my skin again! As soon as it starts getting warm like this – all the heavy soups, stews, and casseroles go out the window. I start to crave fresh, light meals. I saw this recipe using fresh roma tomatoes and parsley, and I knew I had to make it. It was amazing. And really, it was the perfect meal for warmer weather. You could add a little more “heartiness” as my husband would call it with some grilled chicken – and it’s a great recipe for cleaning out your crisper drawer! You can add all the fresh veggies you want! Heat 2 Tablespoons of olive oil and 1 teaspoon of minced garlic in a large saucepan. Once it has started to brown, add 10 chopped Roma tomatoes. 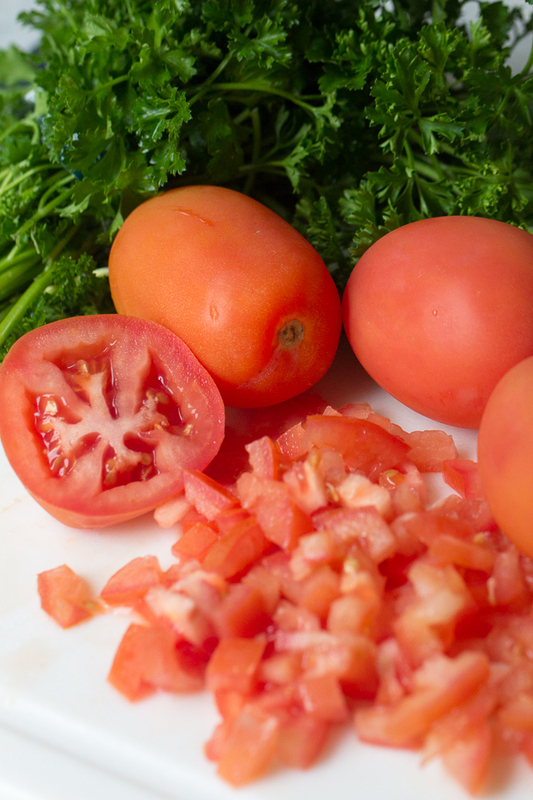 Simmer for about 10 minutes, and then mash your tomatoes with a fork or chop stir. Add salt, parsley, and Cajun seasoning and simmer for about 5 more minutes. Remove from heat and serve over pasta. We love using whole wheat pasta to keep this dish light and healthy. Top with Parmesan and Mozzarella cheese and enjoy! Like we mentioned, grilled chicken or some ground turkey can make this meal a little hearty if your husbands are anything like ours! Large Saucepan – I can honestly say this is the most used item in my kitchen. We use this Saucepan for almost every single meal! 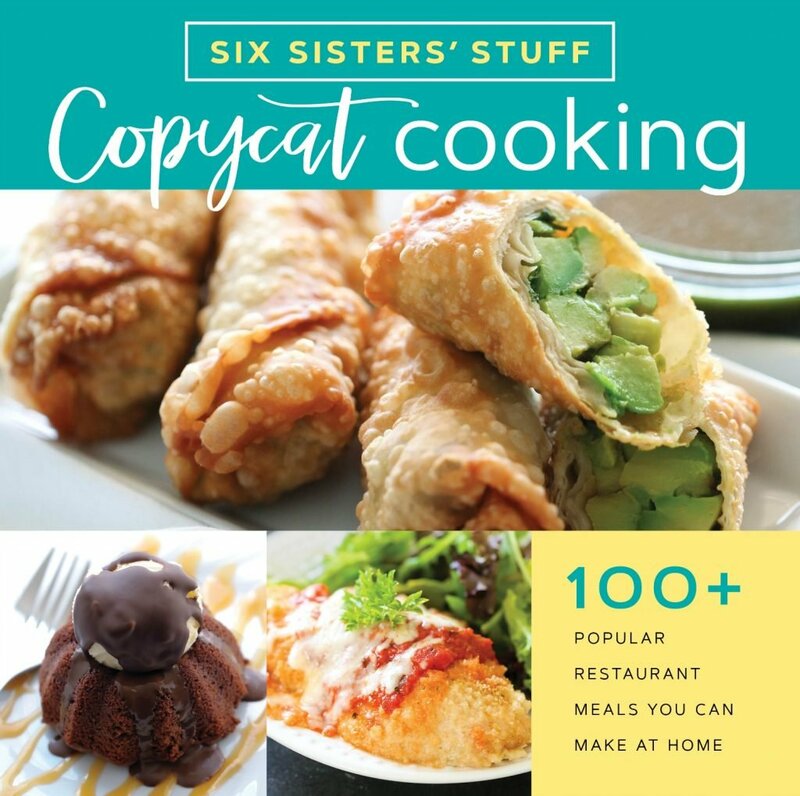 ChopStir – We’ve talked about this multiple times, but if you haven’t heard of a chop stir, be sure to check it out ASAP. 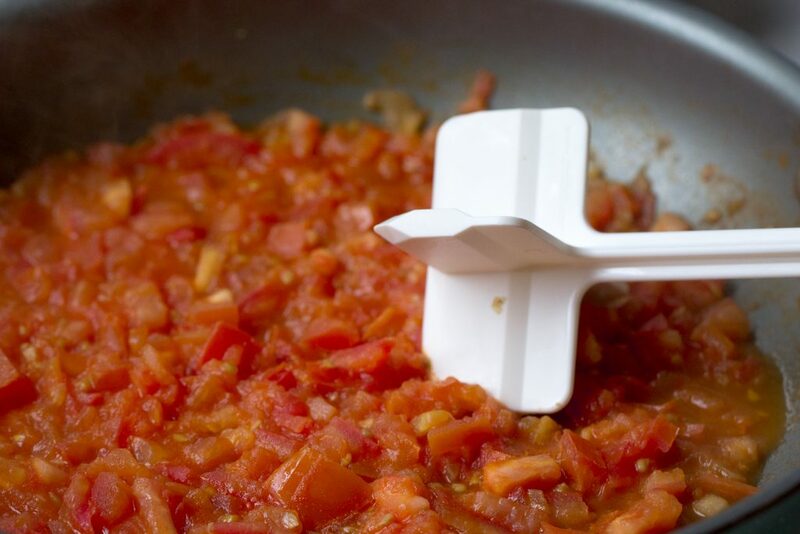 This little tool is perfect for chopping, mashing, and cooking ground meat. It works great on the tomatoes in this recipe. Now that you’ve got a delicious and fresh dinner ready to go, it’s time to find the sides! Here are our favorite pasta side dishes. Add pasta and boil for 8-10 minutes. While the pasta is boiling, heat olive oil and garlic in a large sauce pan. Once it has started to brown, add the chopped tomatoes. Simmer for about 10 minutes, and then mash your tomatoes with a fork. Top with Parmesan and Mozzarella cheese. In this video, we’re showing you how we make Spaghetti Pasta Salad, another one of our favorite pasta dishes! Thank you for this post! Most of the recipes I've seen for Cajun pasta have a heavy cream "Alfredo" component that makes me feel ick afterward. I'm bookmarking this one to make this summer when our Roma plant starts producing.